For a long time, Delémont has been conscious of its energy consumption responsibilities, including consumption in municipal buildings. In 1999, it first received the label Cité de l’énergie©, which has since been renewed twice. In light of its excellent performance, Delémont is also a candidate for the EEA, (European Energy Award) Gold certification in 2007. Completed in 2003, the town’s energy management plan sets forth a strategy and specifies some ambitious goals in all areas, including municipal buildings. Their target for 2010 is to reduce energy consumption and increase the use of renewable energy, with 100% of electricity coming from renewable sources. All new municipal buildings must be constructed in compliance with the MINERGIE standards. The town is also known for its urban mobility initiatives. In 1998, traffic was redirected around the town to reduce congestion in the town’s centre. At the same time, parking was reorganised. The development of public transport is also very important for a town of this size, which made Delémont a true "laboratory" for innovative means of transport. In 2002, the town’s exemplary energy policy won it SuisseEnergie’s "Cité verte" award for its consumption of green electricity and biofuels. The latter was tested on eight community vehicles for 10 years and is now used in all municipal vehicles. Delémont also received the Swiss Heritage Society’s Wakker Award in 2006 for the quality of its urban planning and land management. The Display® campaign was launched at the beginning of 2006 by the caretakers of the three schools who use the poster, followed by a programme in the fall addressing school pupils. a 45-minute interactive presentation for pupils on renewable energy and Display®, in which teachers and caretakers could also participate. a charter for future intelligent developments written and signed by schoolchildren and focusing on best practices in everyday life, at school, and at home. _ Once the outcome of this experience has been evaluated, Delémont will be looking into ways to follow up these projects in other municipal schools. In January of 2006, two "energy weeks in municipal buildings" proposed by SuisseEnergie took place for communities under the motto "saving energy bears fruit" www.citedelenergie.ch. A building was chosen to raise awareness about energy conservation in everyday activities and about how the caretaker can manage energy consumption. Energy consumption was measured before and after the event and presented to everyone to show how much energy had been saved. _ Furthermore, the community offers training courses in energy management to buildings caretakers every year. For several years, Delémont has been brilliantly practicing sustainable energy management. This is thanks, among other things, to the willing participation of the technical staff who take care of buildings. In addition, the town has also begun focusing on encouraging young people to fulfil their responsibilities in energy matters. 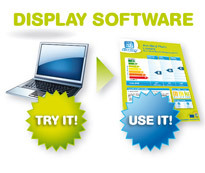 The budget for the Display® campaign are part of the community’s budget. Partnership details _ Delémont’s energy officer directed the work done in the communication campaign in collaboration with caretakers, the organiser of the energy awareness-raising campaign in the schools of Lausanne, and the local press. Lessons Learnt After these campaigns directed at building caretakers, improvements in their energy management in communal buildings were very satisfactory. In addition, pupils and schoolteachers were also very interested in the programmes offered in their schools, which also proved to be a success. Perspective The events that took place in the fall of 2006 are, however, only the start of an even larger campaign. Delémont plans to use the Display posters in other buildings (City Hall, high schools, kindergartens, nursery schools) and monitor the results at the end of the year to compare developments. All of this will lead the citizens of tomorrow to have a better grasp of their responsibility when it comes to energy issues.